Students in the Lexington County School District Three Mentoring Program now have the opportunity to participate in drum lessons thanks to a partnership with Christ Community Church in Leesville. 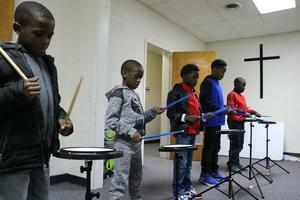 Every Thursday afternoon, Pastor Kent Suits donates his time and talents to teach 10 students from B-L Primary and B-L Elementary Schools the basics of drumming. The students, who were selected based on interest, are each equipped with their own drum practice set that they can use during class. They’re also allowed to take the drum sticks home with them to use for practice on a hardback book. The drum sets were purchased using funds from the Lexington Three Mentoring Program and donations from two generous individuals in the community. The opportunity is free for students, but they are required to sign an agreement stating that they will show up for class each week and practice at home. The goal is to eventually expand the class so that more children are able to participate.